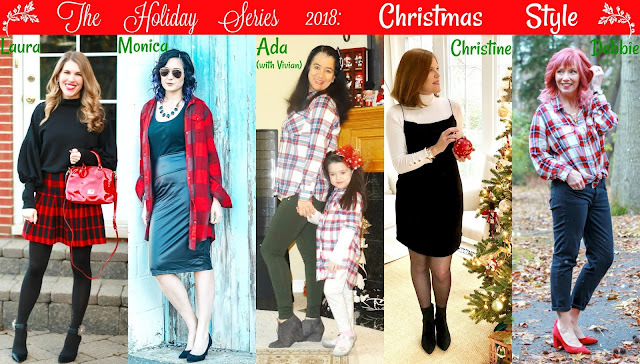 The Holiday Series 2018: Christmas Style. Good Morning. We are just 8 days away from Christmas. My little girl will get a few presents (toys and books) under the tree. Today both Vivian and I are back to present you the 5th installment of The Holiday Series 2018 and this time Vivian and I and ten other stylish bloggers are sharing Christmas Outfits for you all. 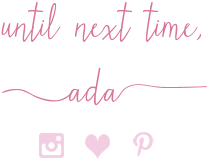 I am so excited about this particular post because I love Christmas and it is also the biggest holiday/celebration in my family. I also love dressing up a bit for it. I am also excited because any chance I get to match my sweet girl I will take it. 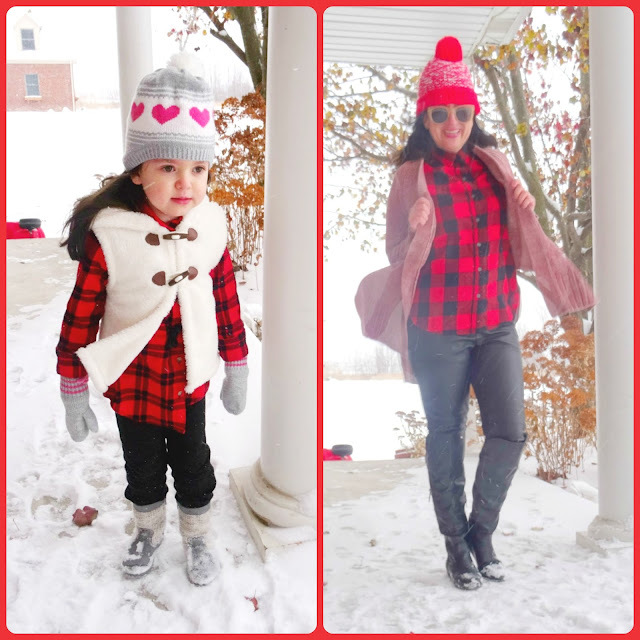 The Holidays in particular are a great time to wear matching outfits with your littles. As I mentioned, Vivian and I will be wearing matching outfits this Christmas. And these are not the only Mommy+Me Matchy Plaid Outfits we have in mind. 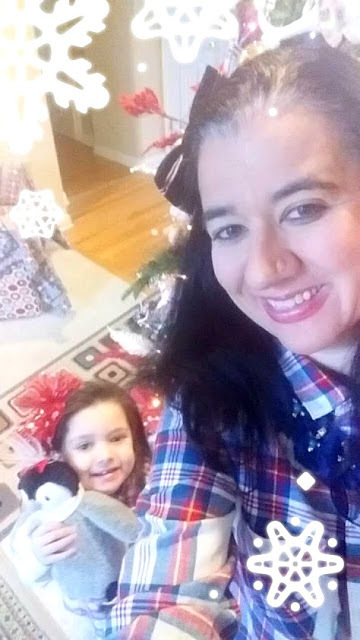 Both of our White, Red and Blue Plaid Flannel Tunics are by Old Navy (recent) and we will wear these or other plaid shirts/dresses come Christmas day. That's because I think Plaid is perfect for Christmas and I cannot think of another pattern that symbolizes the Holidays better. I really can't. Plaid is festive without trying hard at all. I paired my button-down with Olive Green Ponte Leggings by Loft and these Faux Suede Grey Wedge Booties by Target. Vivian wore Shimmery Silver Skinny Pants with Shimmery Silver Mary Jane Flats to match. Both her and I dressed up our simple yet put-together outfits with necklaces. Love my Tulle+Gems Flower Statement Necklace by Sugarfix, by the way. We also wore fun accessories in our hair. 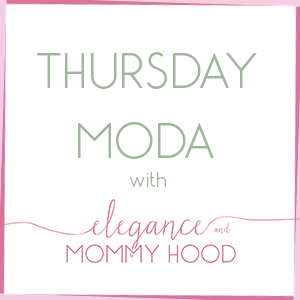 I have on a Navy Big Elegant Bow Clip with light pink and white stripes. Vivian has a Bold Tulle Bow Headband which is Maroon with Silver and it is by Cat+Jack from Target. Even-though Vivian is at that age where she doesn't have a lot of patience for pictures these days, she had fun during this shoot and we actually wore these outfits IRL yesterday on a Wal Mart run and Starbucks date. What do you think of our Matching Plaid Outfits, today?! 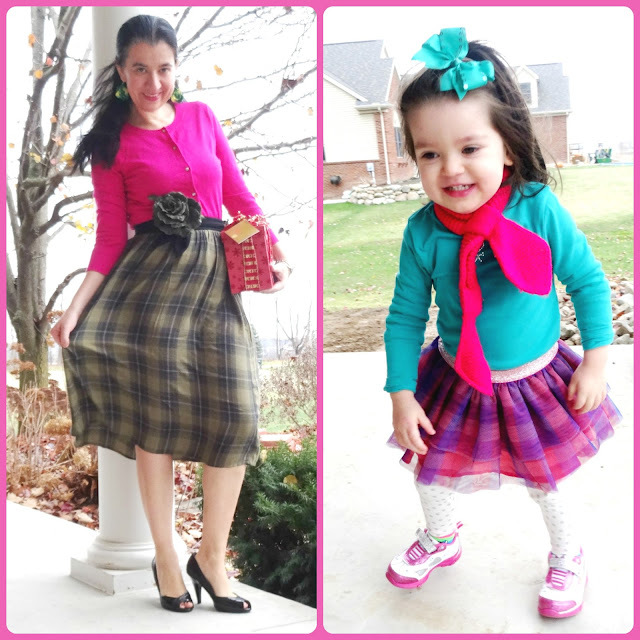 I couldn't help but notice that other ladies had plaid in mind too since it is the pattern most of us wore. Debbie's shirt is even pretty much identical to mine. I also loved seeing a lot of red and I love that like half of us dressed up. Choosing a pair of pumps to wear for Christmas is a great idea, but this year I decided to dress down a little bit. Take a peak at everyone's outfits and Christmas plans, below. HAPPY HOLIDAYS AND MERRY CHRISTMAS FROM ALL OF US!! SHELBEE Shelbee on the Edge "This Christmas I am feeling a bit of a “Bah, Humbug” so when Charlotte Russe offered all of their employees a sweater of their choosing for $10, this cute “Bah, HumPug” sweater seemed perfectly appropriate for my holiday mood lately. Ironically, however, the sweater has cheered me up immensely! 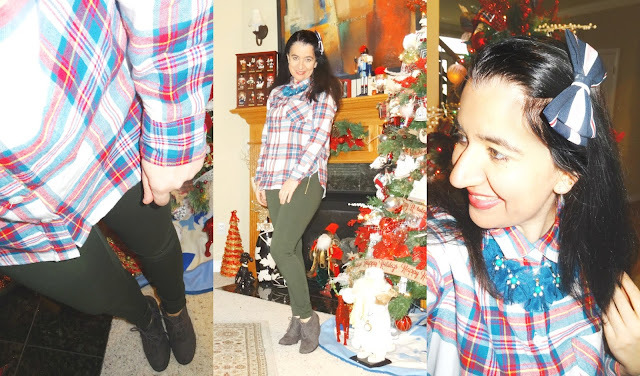 I paired it with a mixed plaid scarf in Christmas colors (from Target last year) and my fuzzy camouflage coat (also from Charlotte Russe). Tan skinny jeans (Target) and dark green sock booties (Burlington Coat Factory) finish the outfit. But it wouldn't be Christmas without my red pom pom earrings (Rosegal) and my favorite knit hat made by my grandmother circa 1950’s. Wishing you all a very merry Christmas and blessed holiday season!" MAUREEN Little Miss Casual "I don’t know about you, but my family get togethers are very casual. Even during the holidays, we like to keep things low key and most of our time is spent indoors. So, when it comes to dressing for the holidays, there’s only one thing that comes to mind - a good Christmas sweater or better known as an ugly sweater. Personally, I am a sucker for an ugly sweater and believe everyone should own at least one in their wardrobe." CHRISSY Granola and Grace "Christmas will be In Florida for is this year so the temps may be in the 50’s, but the temps may be high 70’s so there’s no preplanning on the outfit for me. However, I’m looking forward to making new memories with our little family!" AMBER Avec Amber "Christmas is a time to gather together to celebrate the year’s highs, reflect on the lows, and appreciate each other as we look ahead to another new year. 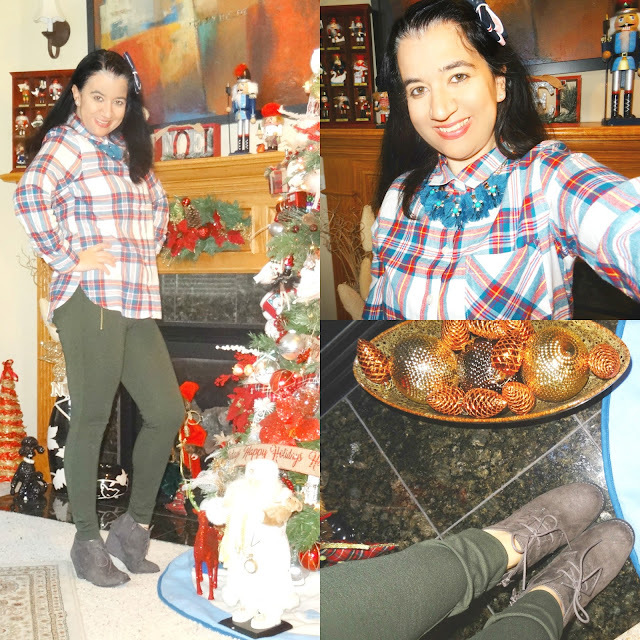 My family keeps it casual, so this cozy plaid wrap, sweater, and jeans combo is an ideal Christmas outfit choice." CHERYL Cheryl Shops "Merry Christmas, Ada! 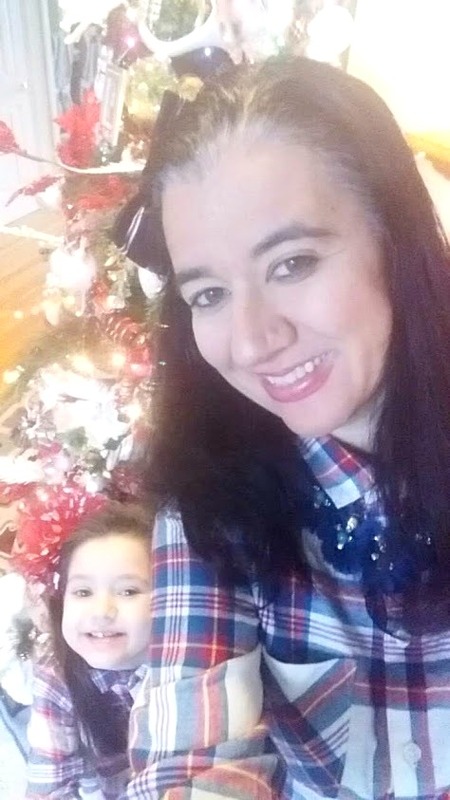 While I live in San Francisco, I was born and raised in Chicago, which is where I spend Christmas with my family. 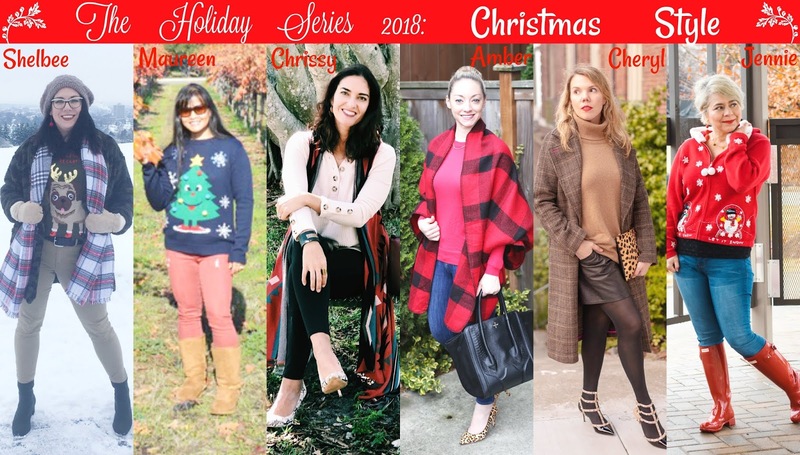 I'm always excited about going home for the holidays, because I get to break out all of my wintry things: cashmere sweaters, leather skirts, and wool coats. This look encapsulates all of those elements, plus a fun pair of shoes for a little holiday sparkle. If it's snowing, however, I might have to change out the shoes for some Uggs! " 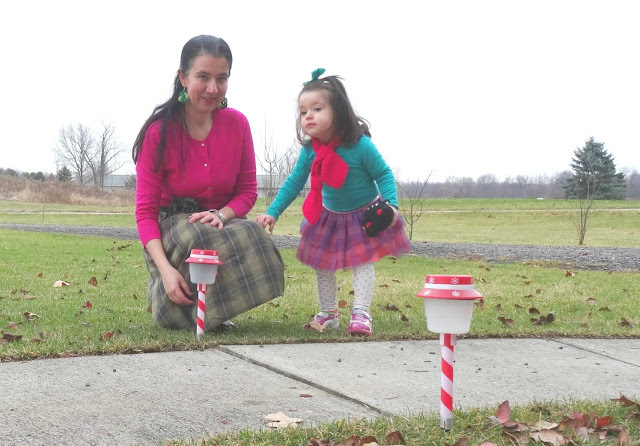 JENNIE A Pocketful of Polka Dots "This year for Christmas I thought I would step outside my norm and wear a fun holiday sweater! 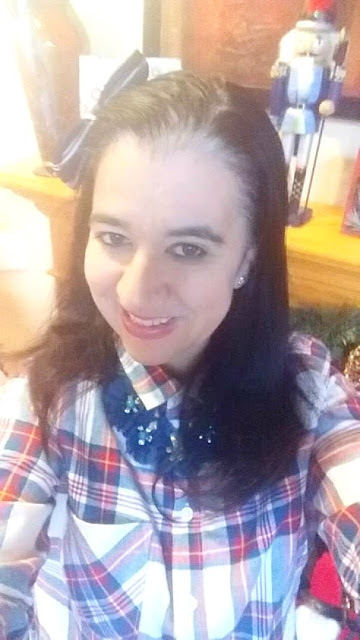 I usually like to dress up a bit, but liked the idea of doing a cute and casual look. 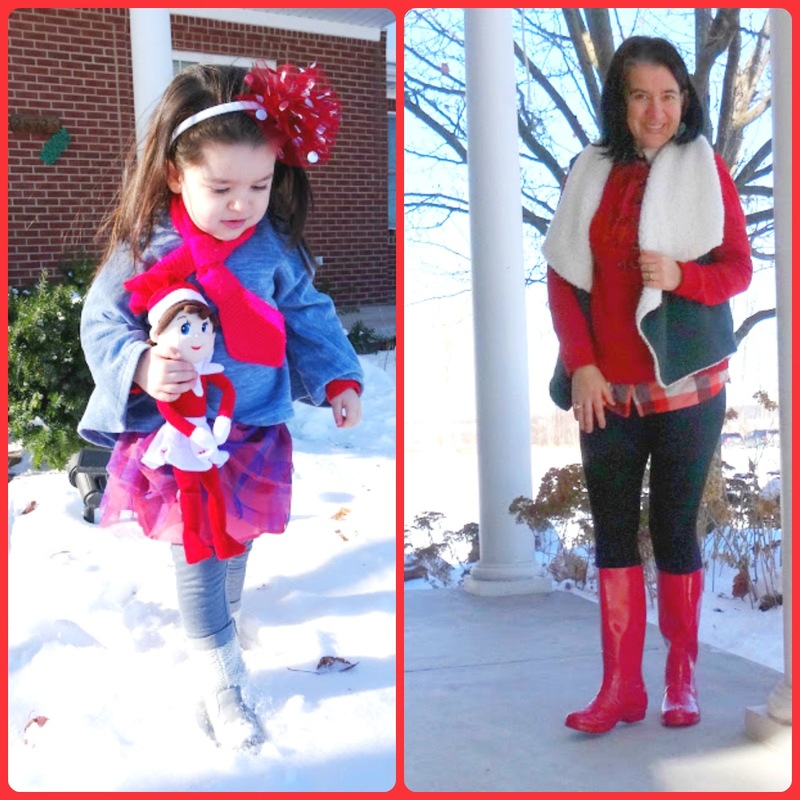 My red Hunter boots add to this festive look." .LAURA I Do deClaire ”We celebrate Christmas by going to church on Christmas Eve as a family, all dressed up. My daughters get a Christmas dress each year. I like to wear something festive for the occasion that has some red in it so this skirt is perfect! On Christmas we enjoy opening stockings and presents as a family in the morning and then in the evening we celebrate our oldest daughter's birthday! 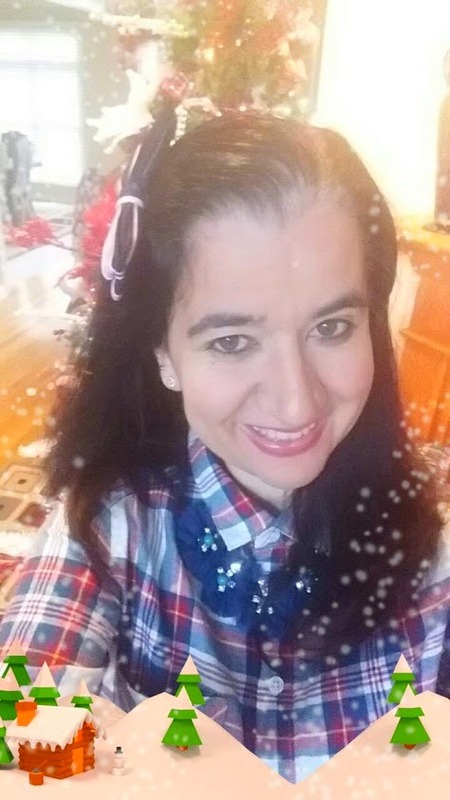 MONICA Jersey Girl, Texan Heart "Happy Holidays y'all! I hope you enjoy every minute of this holiday season with your families and friends. I can't wait for Christmas because I love giving gifts and seeing reactions, and of course the food that my mom makes!" 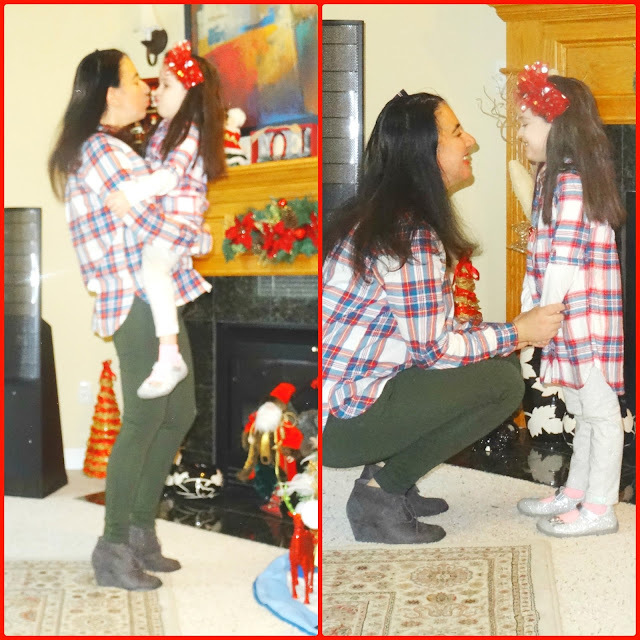 ADA Elegance and Mommyhood "Nothing says Christmas to me more than Plaid. 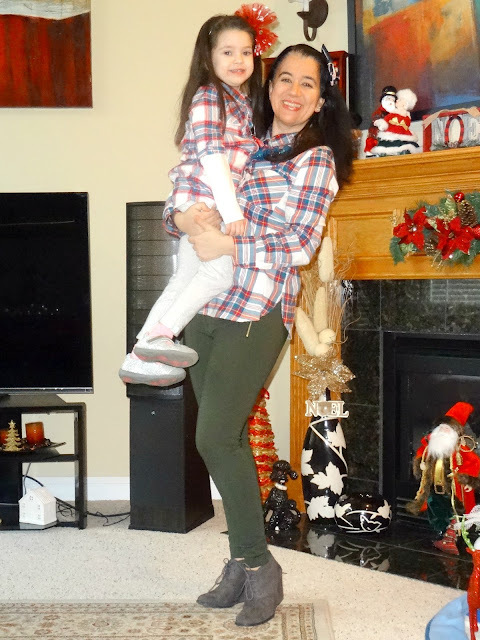 So this year, Vivian and I will be wearing matching plaid tunics (from Old Navy) for our Christmas celebration. We even dressed up our button-downs with pretty necklaces. But truly I cannot wait to see her face on Christmas morning as she opens presents - she is so excited! From our Christmas tree with love "Gëzuar Krishtlindjet!" That means "Merry Christmas" in Albanian - my native language." CHRISTINE Bon and Chic Style “This Christmas’s Eve I’m going for a minimalist look with this chic black velvet slip dress layered with a simple white turtleneck underneath. We always go to Christmas Eve midnight mass and I like to wear a simple dress for the occasion. The sock booties complete this effortless chic outfit and will keep me warm too! Joyeux Noël." 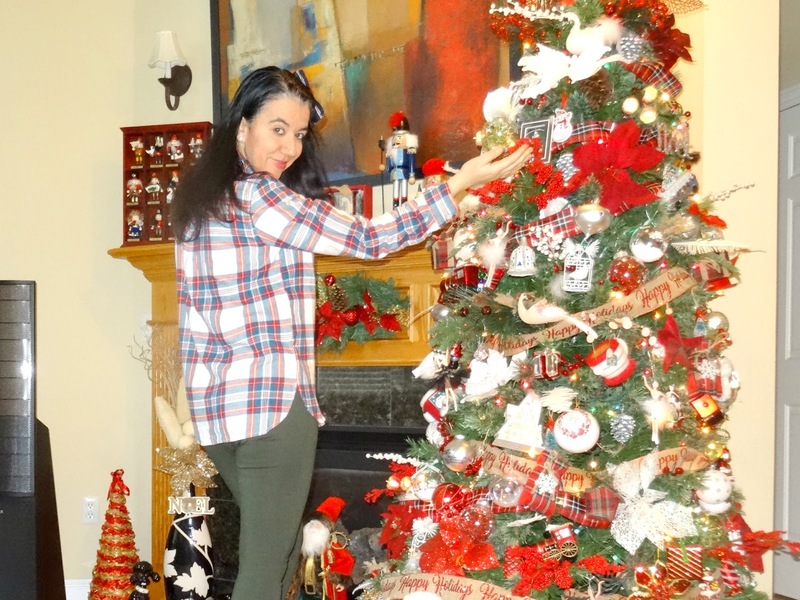 DEBBIE Fashion Fairy Dust "Holidays at our house are super casual. Honestly, this look is dressier than what I'd be wearing; you'd be more likely to find me in this flannel shirt, but paired with boyfriend jeans and my Bearpaw boots. I did kick it up a notch for the Holiday Series though by swapping in my black pants and red suede pumps. The look is still casual and comfortable, but the pumps and pants makes it a little more special." Here are some Holiday Mommy+Me Matchy Plaid Looks from Holidays Past. 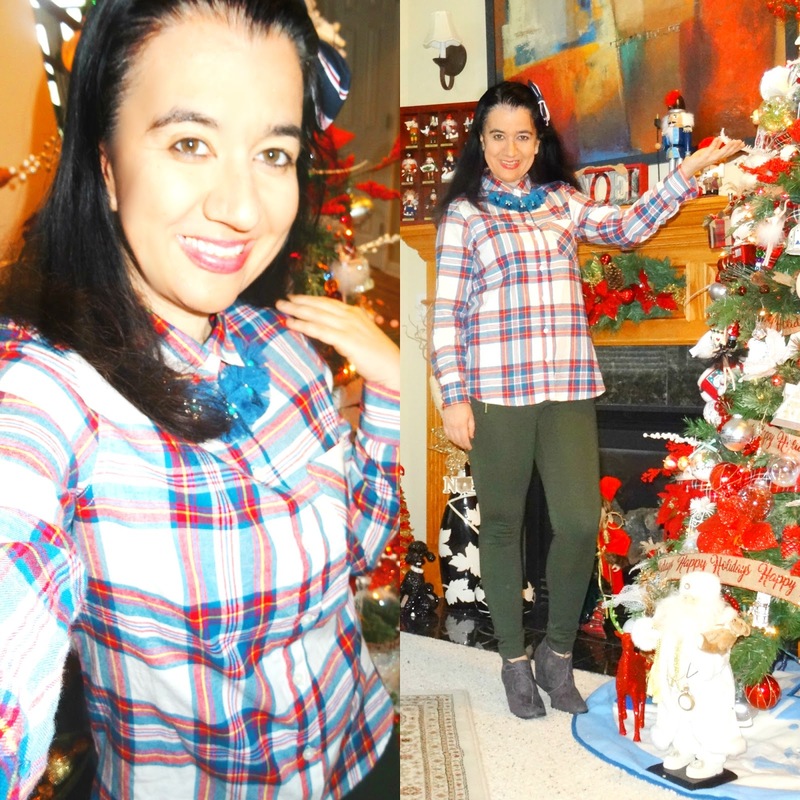 I am telling you, plaid is the pattern of Christmas!! Coincidentally for The Holiday Series last year (photos below) I also wore some Plaid and kept it simple but put-together with skinny jeans, a fair aisle sweater, a buffalo plaid vest and some faux suede ruched knee-high boots. Similar-looking tree also, yet different if you carefully pay attention. I never do the Christmas decor the same!